Rated 5 out of 5 by Yorkiegran from Adelantado trilogy - all 3 Great game, I'm on 3 now, my favourite pathway game ever, my only niggle is that whenever you start a new game (ie 1, 2 or 3) you have to do a boring tutorial level! You should be able to skip the tutorial and get straight on with the game, no one would play 3 without playing 1 and 2 and knowing what they are doing, surely! Rated 5 out of 5 by heatherceana from Very enjoyable game I saw that this was a trilogy, so I decided to give it a go. I very much enjoyed this game! The only real down-side was that you lose all of your progress if you have to stop in the middle of a chapter, and you cannot demolish old, unneeded buildings to reuse space. You are in the "New World" to find survivors from previous trips, to send gold back to the "Old World" and to discover new territory. You build various types of building such as a garden, workers houses, bridges, and mines for various things with buildings to work them into finished products (for stone, silver, etc). You need to cut down every bush you find, because the "secrets" you can discover are behind the bushes - and you do not know which ones. Rated 5 out of 5 by Grannieof5 from Awesome game all around challenge This game keeps you going in all levels. You have to search the trees for help and must find certain things buried under the trees. Also hidden in the trees are survivors, gold, etc. You just have to keep searching as you go along those plus doing the building, putting in rope bridges to get to the next levels and then starting there again! It is quite challenging clear through to the end! Hope you have a really good time! I haven't reached the total end. I am stuck but won't give up till I get through! Rated 5 out of 5 by lilliburrow from I can't wait for Book Two and Three for Mac Great game. Kept me wanting more and playing again. Rated 5 out of 5 by Gametrotter12 from My Favorite Loved this game so much!! It was well worth the money. Plenty of challenging levels and great attention to detail. I saw that there were part 2 and 3 for PC so I am praying that they come out for Mac soon!!! Rated 5 out of 5 by Lindaling from Great game Absolutely worth to play! Great gameplay en puzzlefun. Good for lots of hours of play. Rated 5 out of 5 by tutortime from Bravo! More like this one, please ! Loved this game. Can't wait for Book 2 and 3 to come out. It seems to take forever to get games for MAC, but this one will be worth the wait. Rated 5 out of 5 by mcqueenn from Bring on Books two and three! 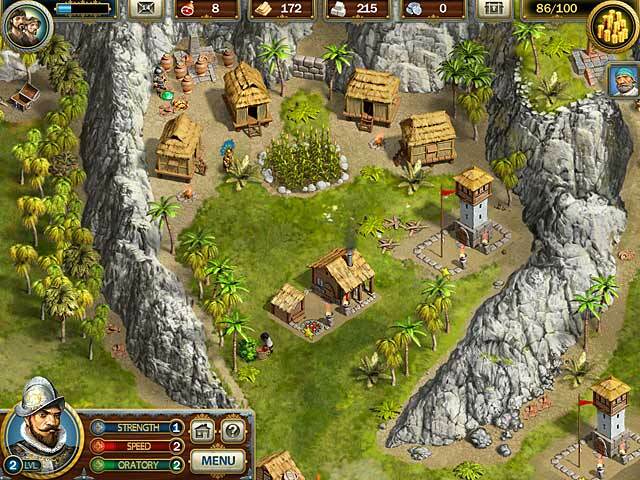 A really different strategy game, with the resource management aspects of Road to Rome but with dungeons. Beautiful graphics. Please bring on Books 2 and 3 of the trilogy for Mac users! Rated 5 out of 5 by AngelBaby09 from Excellent and Fun! I love playing this game! Pathway games are a lot of fun, however this pathway and "build a lot" together in one without the "lot" restrictions! Very fun and addicting! Rated 5 out of 5 by tehuti88 from Adelantado Trilogy: Book One Way, WAY back when (i. e., sometime in the Nineties), I used to play an old PC game whose basic premise was you were a Columbuslike explorer headed into the New World, where you would explore/map the land, interact with the natives, build missions and forts, and collect gold to send back to Spain. There were two modes of the game--the "historic" one where you explored a New World modeled closely after the actual New World, and one that used a randomly generated map. Goodness, how I've missed that game. Well...while browsing around Big Fish, I stumbled upon "Adelantado Trilogy." Although I despise time-management games (FAR too stressful for me), and am not a big fan of most strategy games (I'm lousy at planning), the premise reminded me so much of that old PC game that I had to give it a try. So I downloaded the free trials of all three parts. And quickly ran through the allotted hour of every one of them. And then bought each game. My, oh my. It's that Nineties game all over again, only better! First off--there's an untimed option. Otherwise, I wouldn't have bothered. So those of you like me who are bad at time management, that's a plus. The graphics are relatively simple since the entire game is presented in a sort of "bird's-eye view" of whatever New World this happens to be, but they're crisp and clear and colorful. There was a glitch or bug of some sort in the first part of the trilogy (it was present in both the free trial and the full version of the game) that caused a sort of flickering in certain sections of the screen, like another scene was attempting to interfere/cut in, but, though this was vaguely annoying and could make reading informational popups a bit difficult, it didn't significantly interfere with gameplay, so I could overlook it. Plot: Don Diego De Leon, the "Adelantado" in question, is exploring this New World. Apparently, some men from this or an earlier expedition have gotten lost in this strange territory, and it's your job to rescue the survivors. At the same time, you have to build and repair numerous structures, such as gardens, watchtowers, mines, etc. ; and in between seeking survivors and building/maintaining everything else that provides you with the supplies you need, you spend time exploring the new land, locating gold, precious gems that enhance certain abilities, and "secrets"--the latter of which consist mostly of lost journal pages. 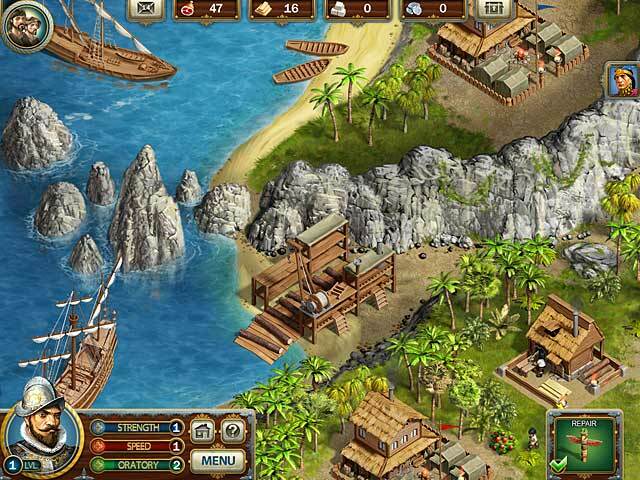 Throughout the game you rely on your supplies of wood, stone blocks, food, and silver to build and upgrade things as well as trade with the natives, so it's important to make sure you keep your buildings on track so you don't run short. You progressively gain more area to explore. The Indians give you missions to fulfill and in return present you with helpful hints and directions to yet more territory and treasure. If you wander around and keep your eyes open, you'll find random supplies to collect/destroy and help replenish your stores. There are natural obstacles to destroy to reach inaccessible areas; also, you should be careful to scroll your mouse over EVERYTHING, because there are "secrets" hidden everywhere. Each level or "chapter" has a certain number of secrets, gold, and survivors you need to locate (finding the secrets isn't necessary to pass a level, but I felt the need to do it anyway); this is kept track of during gameplay so you can check to see if there are any secrets remaining. Hint, make sure you repeatedly check out previously explored areas and keep your eyes open--just because you've already explored an area doesn't mean it's out of surprises! The game has two parts of five chapters each, plus an extra end chapter. Each level gets a little more difficult and has yet more goals to be met. Don Diego almost constantly "nags" you by telling you what you need to do next--more experienced players might find this annoying, but oh goodness did I appreciate it, as otherwise I never would've known what to do. (Though it got annoying when I knew what I needed to do next yet didn't have the proper resources yet; many times I found myself grumbling, "I KNOW that already, Don Diego! I'm getting to it!") I'm not sure if he also does this in timed mode. Where's the conflict in the game? A few of your men have rebelled and deserted you...as well, by the time you've settled into a comfortable routine of exploring, collecting, etc., all of a sudden, BAM!--evil cavemen! :O They aren't terribly overwhelming, but this brings me to the one big quibble I have with the game. You're always warned when a caveman appears; but I do wish the "camera"/bird's-eye view would shuttle you to the location where the caveman has emerged, because each level is very expansive and you never know where a caveman has emerged from; you can spend a moment or so looking about frantically by dragging the mouse back and forth until you spot the caveman, and by then he's already on the attack. You can also accidentally misclick on something while doing this. This is a relatively minor quibble though, considering. It'd also be awesome if, like the other game I mentioned, it had a "random land generator" function so each playthrough would be different, though I imagine that'd be quite difficult to program, and would make walkthroughs useless. And, oh...it did bug me that the Indians made reference to "chariots." Huh? The game keeps track of how long it takes you to make it through each chapter. In total, gameplay for me, on untimed mode, was over 11 hours, so...you get a LOT to do. IMPORTANT NOTE, however, you can't save the game in the middle of a chapter, so if you start a new level, you have to be committed to finishing it in that sitting. As the title should make obvious, this is merely the first part of three...I have yet to play the other two, and I imagine they get more difficult, so I'm rather nervous about that and hope I can make it through them; I'd hate a lack of success to dampen my enthusiasm for the trilogy. (I'm a sore loser.) So I offer this review with a bit of reserve regarding Books Two and Three. But the first part alone, I HIGHLY recommend; it was just so much fun to explore everything, help out the natives, and collect all that food, wood, and gold! (As well as destroy random items!) 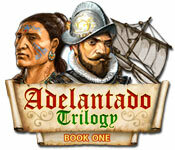 I obtained my copy of "Adelantado Trilogy: Book One" directly through Big Fish Games. The game folder takes up 131mb on my hard drive. I ran this game on Windows 7 with one bug/error (the glitchy screen flickers, mentioned above) but no other problems. Rated 5 out of 5 by lmay63 from adelantado book one Great Game! Offers many hours of game play. Rated 5 out of 5 by zaqston from Great strategy game You'll read lots of reviews that explain this game so let me just get to the point. Things I liked: You have the time you need to complete missions. Storyline was alright. The map didn't fit in one screen. There was more to this than a simple template I felt. Rated 5 out of 5 by ddka11 from Loved it! Challenging game. Bought book 2 as well. Rated 5 out of 5 by NancyWar from Now I Understand! I was puzzled by the big gap between the rave reviews and the negative reviews (some of which said it was too difficult and some which said it was too easy). After playing the hour trial (and with no hesitation, immediately buying), I think I now understand. If you have played a Roads of Rome game before and enjoyed it, you will likely really enjoy this; it's similar but a bit more challenging in that it's not totally linear and (in my opinion) has a better storyline and more depth. But if you have not played Roads of Rome or something very similar, I can totally understand how confusing it could be because the instructions are really not very clear for a beginner. Please understand that this review is based entirely on the one-hour trial which I apologize for; I usually don't like those kinds of reviews but since it is on sale for only a few hours more I decided to put in some input now and perhaps update it when I'm finished. Therefore I can't speak to the difficulty level except at the beginning (on "normal" - thankfully it does offer a range of difficulty levels), which seemed to me just right. The fact that you can only save at the end of a level may turn out to be frustrating, but not dissimilar to other games of its' type. The bottom line is that If you've played and enjoyed a Roads of Rome game, you'll most likely really enjoy this; if you have not I would recommend starting with one of the more basic games, like Roads of Rome I or II, to first learn the ropes and then taking this on. Rated 5 out of 5 by parkersam from Adelantado trio bk one As a new comer to this type of game I found it delightful. and now I look for games like this. some I cant see how to finish some levels, others are a piece of cake, but the enjoyment is there, what more can you ask of in a game. Rated 5 out of 5 by erniemink1970 from Fun and addicting game. I enjoyed it! I love this series, and have since played both one and two. They are better games than the norm, and a rest away from the common and overdone hidden object and match 3 games you often see on this and other websites of it's caliber. I like the storyline, playability and the fact it was not over challenging. I loved it so much, I played it straight through in one day. Rated 5 out of 5 by maarja0 from A fun game I love all aspects of the game - that you can try different difficulty levels, that you have lots of autonomy in how to build up your colony, that there are quests, but you have to figure out yourself how best to complete them (how much of which resources you need) etc. The game is timed, but not a desperate clicking like many time management games - more of a strategy game. Can't wait for the next chapter! Rated 5 out of 5 by JustTheFacts from My Favourite Resource Management Game GAME COMPLETED SEVERAL TIMES You are a Spanish conquistador charged with rescuing the lost expedition of Adelantado, rebuilding abandoned encampments, dealing with the locals and exploring new territory. And of course the most important sending home gold to Spain. History is messed with pretty severely here – all the native tribes are happy to see you, you offer only help and don’t slaughter any of them, and the only threats are from cavemen. Still, it’s a great adventure. You have 4 levels of difficulty to choose from, including relaxed with no timer. Or you can play with timer, and even if you don’t finish the level in time, can go on to the finish, and still move on. Some levels are only available if you have completed all other levels to expert status. About a year ago, I thought I’d find out about resource games and trialled a dozen of them. This is by far my favourite. There is a lot more flexibility in this game, to do your own thing – where you put buildings, which buildings to go for first. There is a lot of instruction given, but after the first stage of a level you can choose to ignore the advice. The game looks good, the characters move well, and the sounds are a fun part of the experience. There are many different kinds of locations to explore, each level map is quite big, and there are lots of little side quests as a result of interaction with others. There are jewels to find that enhance your abilities such as speed and oratory, and secrets to be learned (but which are not essential for progress), so Don Diego does a lot of beating the bushes and breaking jars and barrels, while the workers follow his instructions to build, mine etc. At the end of each level, you get a piece of a golden artefact. The biggest frustration I found with the game was the space restrictions when trying to expand the settlement. There never seems to be enough to do what needs doing. So the fact that no building, even abandoned ones, can be demolished is a pain, but I notice this is fixed in the next Book. The tutorial was enough for me to play the game through even though I was a totally raw beginner, but it might be too much hand holding for some. I had a wonderful time with this game, and completely lost myself in it, even though it is not my usual genre choice. Rated 5 out of 5 by P_nillen from Good gameplay. Worth every penny!! Many puzzles and building challenges. 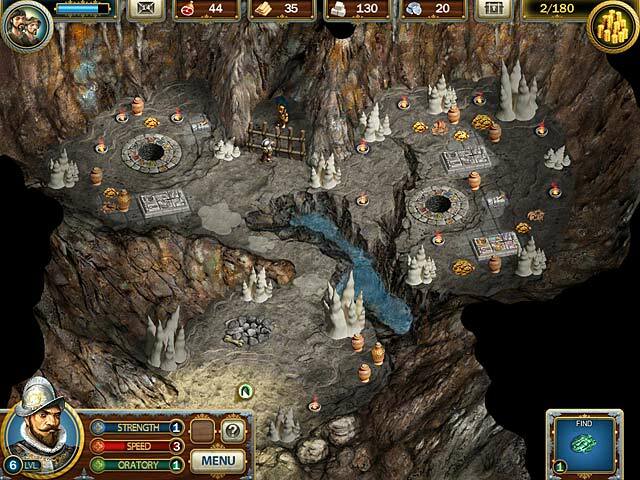 Many hidden objects, treasures. I was greatly entertained. Only critic: In the game, the Indians are ever so thankfull to the "heroic" concuistadors ... and have you read a little history and know the real story, then ... well, it has a really good gameplay and you get a lot for your money! Enjoy. Rated 5 out of 5 by gjr1 from one of those games I could not stay away from Finding it more and more difficult to find games I really enjoyed. This was one of them. Rated 5 out of 5 by Gameritis50 from Highly addictive Great game. The music, the game play, everything about this game is smooth, and something different to play. Rated 5 out of 5 by alsteele28 from Good almost retail quality game As book two is the 'game of the day', thought I would start at the very beginning (a very good place to start), and see what the game was all about. The game is good. I have played loads of these style of games (starting to overtake my love of HOPA games), but this is more 'meaty' somehow. Whereas other games of this genre, you are just usually controlling one entity at a time (donkey, human, dwarf etc, depending on the game), with this game you can 'micro manage' several different people at the same time, thus multi-tasking is taken to a whole new level (well where these games are concerned), this then to me gives the game more depth as in order to complete all the tasks you need to keep an eye on all the 'game-land' in order to complete the tasks to order. If you forget one entity of the tasks to be completed then you will probably not complete within the 'game day' and get extra rewards (I for example completely forgot to build the boat on the second day, thus lost out). Just to let you know thinking that I was an 'aficionado' at these types of games I plumped for the 'hard mode', and had I thought on I would have probably completed this day within the time. If you are used to these types of games then I would probably go for the normal (if you perhaps want an easy(ish) challenge, or hard if you want to 'push yourself' I know other reviewers have criticised the fact that the tutorial is not very interactive and is mainly reading (and yes you need to be able to read and understand English to a reasonable level (sorry didn't mean to sound patronising there to anyone but I know there is perhaps a large demographic that plays these games and English is perhaps not their first language), though having said that the English is sound (both of spelling and grammar, which is not always the case), and it is easy to read (again not always the case). For this genre the music is good and gives the overall game a 'epic' feeling, one where you feel that something dramatic is happening. Sometimes on this genre I may turn the music down but not for me on this game. Overall I would certainly recommend the trial of this game, and if you want a bit more micro-management and a blend of retail style game (those that you pay £35 for in store), such as Civ-rome etc with a more casual game playing aspect then this game is definitely worth the money (especially if you use a free punch token), I will definitely be 'purchasing' this game and more than likely the second in the trilogy.